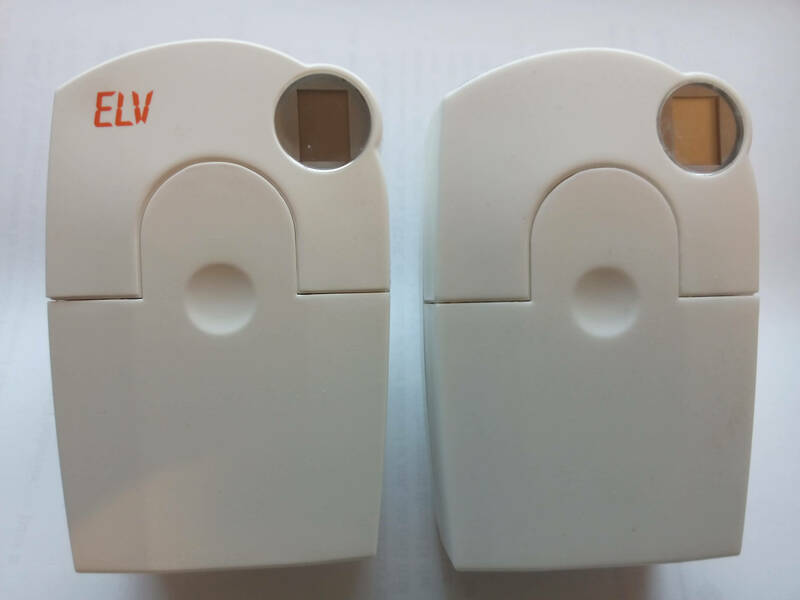 Two-part wireless programmable TRV (radiator unit and thermostat/scheduler); FHT8V can be used with OpenTRV REV2 control units also. The Tip of the Iceburg? Works, is reliable and simple to use. The FHT8V on its own does not regulate temperature, and uses the FHT80B companion module in the FHT 80BTF set to do that, which works well though I had one possible lock-up. However, I've been using FHT8Vs with OpenTRV where they have been a reliable workhorse and though there may be quieter devices on the market these do the job. Separating the thermostat/scheduler from the radiator valve potentially gives more accurate temperature control and easier setting of values without crouching down beside the radiator! This wireless unit can potentially be knitted into a much larger house-wide "FS 20" system that can "call for heat" from the boiler from each room separately, providing soft zoning without pipework changes. A FHT 80BTF set was purchased over the phone from Conrad's UK store, and arrived quickly (via courier) on 2013/01/21. The accompanying paper documentation is all in German, but an English translation (PDF) is available online, including set-up instructions. The TRV and thermostat/scheduler units are pre-paired, so there is no set-up to to to get them to talk to one another once the batteries are in. 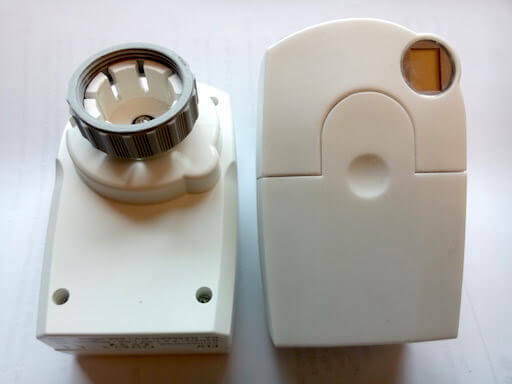 The FHT8V (TRV) seems to be aimed at horizontally-oriented TRV heads, and I thought that I was going to have difficulty putting it on my (vertical) TRV body having unscrewed the existing Bulldog-brand TRV head, but all was fine. I want to change the 'day' setting to 19°C, and put in a simple schedule to (for example) warm the bedroom (where this is installed) before bedtime, and ensure auto-off at night by default to avoid being left on by accident, and otherwise I will flip manually between heat and 'off' depending on whether I happen to be using the room during the day. Setting the 'day'/comfort, night and window-open temperatures is simple with the moon/sun button and thumbwheel, and is in 0.5°C increments. I adjusted them to 19/6/8 from the original 21/17/12. I then set a program for all days, a before-bed warm-up of up to 90 minutes, fairly quickly and painlessly, and ticks are shown along the (bottom) edge of the display to show when heating should be at 'comfort' temperature, much like the i30. So far I am working in 'auto' mode, with any temporary override to on/off (night/comfort) settings reverted at the next programmed time, just as I want. having had the thermostat unit near my desktop temperature sensor I observe that the system seems to do a reasonably good job of regulating to the specified temperature. There does not seem to be any way to display what the thermostat thinks the current temperature is, unfortunately. Note that the FHT8V is manufactured by ELV/eq-3.de. 2013/01/22: am: I've moved the 'comfort'/day temperature down to 18°C to see how I get on. 2013/01/22: pm: Maybe a little chilly so I'm trying 18.5°C instead, though of course no one temperature will be right at all times. Although I didn't detect any such problems myself when I was last using them, Bo H in Denmark reported at the end of 2018 that his devices had become increasingly unreliable as his building was fitted with wireless fire alarms and similar. This is not astonishing, given that the radio modulation technique (OOK) used by these devices is quite crude and old-school. Beware of this possibility before making any new purchase of these devices. 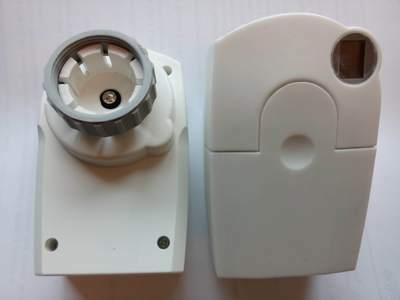 Conrad FS20 Wireless actuator 570056 and cheaper self-assembly version. First published 2009-12-13 , updated 2019-04-22 . Site copyright © 2007-2019 Damon Hart-Davis. Hosted by ExNet.